Two teams took part in a ‘serious and complex’ rescue of a fallen climber on a remote Cairngorms crag. For Cairngorm Mountain Rescue Team, it was the seventh callout in seven days, four of which have been technical rockface incidents. The Cairngorm team and Braemar MRT were called out on Saturday to rescue an injured climber on the Shelter Stone Crag, which has some of Scotland’s longest rock-climbing routes. The Inverness Coastguard helicopter also flew to the scene at the head of Glen Avon. Cairngorm team members reached the climber and the team doctor provided immediate medical care. The injured man was lowered from the crag into the corrie bottom and then stretchered to the helicopter, which airlifted him to hospital. Volunteers from the two teams were then faced with a long walk back through the night with their equipment to their respective bases. Aberdeen MRT also provided cover for the Braemar team on a simultaneous callout. Cairngorm MRT describes the Shelter Stone Crag as having some of the best and longest hard rock-climbs in Scotland. On Thursday, the Cairngorm team was called out to rescue another fallen climber on a scrambling route on Ptarmigan Ridge on Lurcher’s Crag or Creag an Leth-choin, above the Lairig Ghru. A Maritime and Coastguard Agency spokesperson said: “The alarm was raised just after 4pm and due the remote and inaccessible location the Coastguard helicopter was called in. “Two mountain rescue team members were winched in to help our winchman paramedic treat the casualty, whilst the rest of the mountain rescue team were standing by at the rescue base. “After being made comfortable and stable the casualty was winched on board and taken to Raigmore Hospital. We wish him a speedy recovery. A Cairngorm MRT spokesperson said: “The fallen climber’s mates did a superb job of getting him down to a ledge, but the ground below was too complex and too serious for self-rescue. The previous Saturday, Cairngorm team members carried out a rescue on Cairn Gorm in conditions described as ‘extremely dangerous’, due to rockfalls on the cliff in Coire an t-Sneachda. 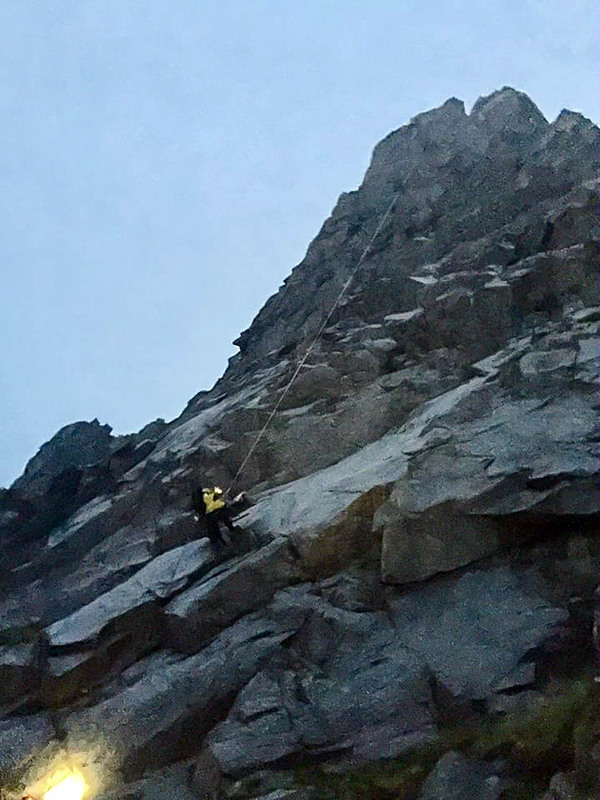 A long, technical lower of the injured climber took place on Fingers Ridge as falling rocks rained down the crag face. The following day, the volunteers were out again in the same corrie after a falling rock injured a climber on Pygmy Ridge. Ron Walker, an experienced mountaineer and guide, described how he was almost killed in the Fingers Ridge incident while trying to make the area safer by clearing loose rocks. He posted on Facebook: “Andrew and I climbed, making the route and the Goat Track path below that much safer. “I was quite pleased with the amount of dangerous rubble we managed to clear from the first two pitches. However at the top of the slabby corner of pitch three, just past the optional loose block belay on the left and after about a metre or two on the loose arête, a large area of slab just slid off with me on it. “I fell backwards with the slabby guillotine-like blocks following me in flight until the one wire runner placed at the start of the arête came tight. “I’d really thought I’d had it as the large flakes would have taken my head and arms off. “However by some miracle the fall held after about five metres and left me hanging upside down on the damaged rope. Amazingly I’d only got hit by one block as it bounced by hitting and crushing my right arm. His companion managed to lower him to a ledge and called for help. 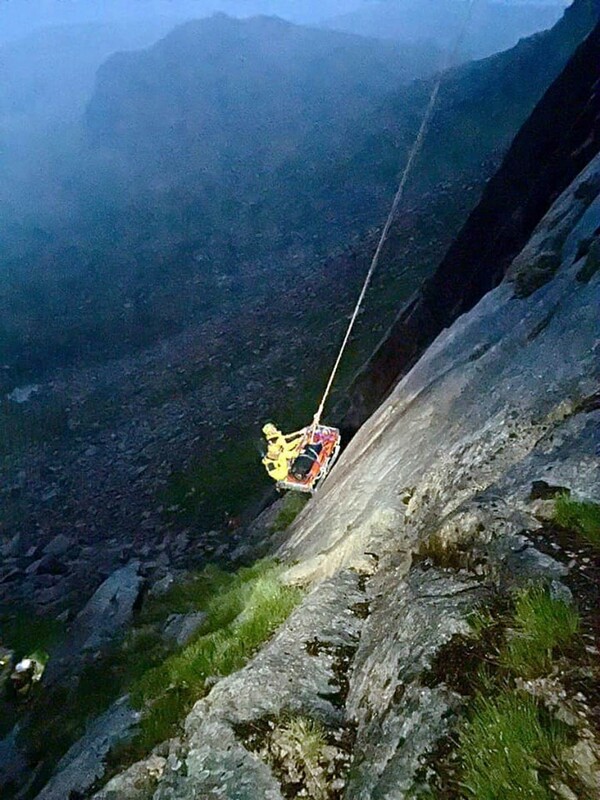 It was another six hours before he was finally lowered down the crag by Cairngorm MRT and then airlifted to hospital. He said: “A big thanks to Cairngorm MRT and in particular John Lyall and Duncan Scott for risking their necks in a particularly tricky and dangerously loose rescue and to Andrew, my second climber, for remaining calm and supportive, in miserable weather three pitches up, for the six or more hours following the accident before being lowered off. He is expected to make a full recovery over the next month.